Tantawi – The New Mubarak? 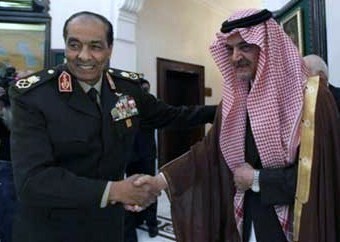 Tantawi and the Saudi foreign minister. May 21, 2011 update: Egypt's strongman, Mohamed Hussein Tantawi announced that Riyadh has pledged US$4 billion in aid to Egypt. Comments: (1) As one Egyptian puts it, these funds assure that "Egypt remains an ideological colony of Saudi Arabia." (2) One can only guess how much money – perhaps more than this amount – is directed by the Saudi authorities toward Salafi groups in Egypt. May 22, 2011 update: An Ethiopian commentator, Keffyalew Gebremedhin, notes that "the Mubarak regime is only decapitated but its unhealthy legacies have not been uprooted yet." 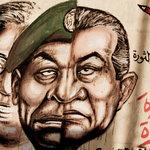 May 24, 2011 update: Khaled Abu Toameh writes at "Egypt Run by a Military Dictatorship" that "Hosni Mubarak is gone, but dictatorship in Egypt is still alive and kicking. … In light of growing uncertainty and scenes of anarchy and lawlessness throughout Egypt, it is highly likely that General Mohammed Tantawi, head of the military council, and his colleagues will not cede power to a civilian and democratic regime." June 1, 2011 update: Rami Essam, an Egyptian musician, discussing torture of anyone who criticizes the military: "Mubarak left, but it's the same people, the same thing." June 21, 2011 update: Ghassan al-Jaabri, 35, a Gazan who had hoped to visit Ukraine when the border with Egypt was declared open: "It seems nothing has changed and we are still locked in this big jail." 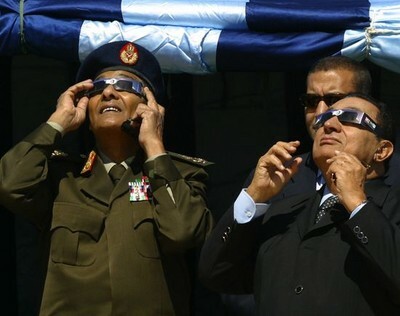 Tantawi (left) and Mubarak (right) wear special glasses to watch a solar eclipse in 2006. June 30, 2011 update: Dina Guirguis of Washington Institute for Near East Policy documents continuities with the old regime in "Violent Repression of Protests: How Much Has Changed in Egypt?" One quote: "the highly mysterious and sudden resurgence of elements from within the despised state security apparatus" attacking peaceful demonstrators in Cairo's Tahrir Square on June 28-29 "raise questions about the extent to which Egyptians have truly dismantled the former regime." July 15, 2011 update: Alaa Al-Aswany, author of Yacoubian Building, a renowned book and movie criticizing the Mubarak regime, writing in Al-Masri Al-Yawm: "Though it has been a full six months since the revolution, not even one of its goals has been realized. In fact, it sometimes seems as though the SCAF [Supreme Council of the Armed Forces, headed by Tantawi] is pulling in the opposite direction. … The SCAF's administration since the revolution has not been revolutionary in the slightest. It is leading the country into a dead end and towards dangerous conflict. Millions of Egyptians, who carried out one of the greatest revolutions in history, were [initially] happy to place their revolution in the hands of the SCAF. But six months later, they have discovered that nothing has changed, so they have taken to the streets, demanding to implement the goals of the revolution – but the SCAF, it seems, does not wish to comply." July 25, 2011 update: Wael Kandil, a columnist in the independent daily Al-Shorouq, wrote sarcastically about the continuity that "The only thing left is to bring a tailor to take Mubarak's measurements to make him a new set of suits for his triumphant return." Aug. 4, 2011 update: Dina Guirguis and Eric Trager of Washington Institute for Near East Policy: "By accommodating Islamists at the expense of the revolutionary protestors while publicly – particularly in the international arena – casting hardliners as a national security threat, the SCAF is seemingly reverting to the former regime's formula of using Islamists to ward off domestic and international pressure for expanding liberties." Nov. 10, 2011 update: Basem Kamel, a liberal candidate for parliament: ""The regime has still not changed." Nov. 22, 2011 update: With Egyptians taking to the streets again, demanding that there be a real change of regime, not just a change of ruler, my argument that Tantawi = Mubarak has become an acknowledged fact and with it the end of the need for me to document that here. Now the new question becomes: can the Egyptian masses truly render change? Their Libyans neighbors accomplished this, as symbolized by the reversion to the monarchical flag. My inclination is to say no, that the military autocracy will last out the demonstrations. But we shall see soon enough. July 16, 2012 update: The New York Times ran an Egyptian graphic today that shows Mubarak's and Tantawi's faces joined together.